"3LA1, V-1983" by Timothy K. Perttula and Robert Z. Selden Jr. CONTEXT INFORMATION: From a grave (Burial 1) in Burial Plot 1 (Martin 1939). Associated vessels in the grave include V-1978 ½ to V-1982. DECORATION: The upper rim panel has a row of excised punctations under the vessel lip, along with a single horizontal engraved line below the punctations. The lower rim panel has four appliqued nodes (that extend from the lower part of the lower panel onto the vessel body) between a repeating simple scroll motif that consists of two sets of four vertical engraved lines and two connecting diagonal lines. There are excised punctations underneath each of the scrolls and along the vessel carination. Belcher Engraved, var. 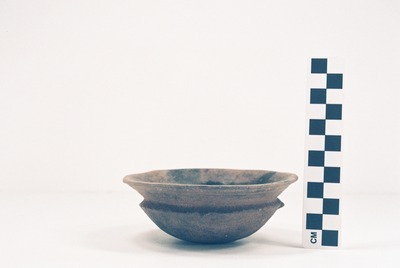 Belcher carinated bowl (5425-706).